Selecting the best paintball gear for advanced players might seem like a silly topic for an article. You’d expect that an advanced player would know enough about the equipment to make a quick decision on their own. This isn’t an article where we review a couple of pieces of paintball gear and tell you which one is best. There are plenty of other websites that try to do that. Instead this article simply gives our tips for narrowing down your choices and finding the right paintball equipment for you. Read on for our guide to make sure your next paintball purchase is a good one. How will you use the marker? Will you be playing paintball tournaments and/or scenarios? Is the weight of the marker important to you? Is ease of maintenance important to you? Are repair services and parts available to you locally? Is the marker a new design or the latest revision of a design that’s been around a few years? Does the manufacturer update their design annually? If so, when is the next model due to be released? Is a used paintball gun an option? Each of these questions will help you narrow down the list of paintball markers that will fit your needs. Once you’ve answered those questions, take a trip to a paintball store near you and ask the staff to show you some paintball gun options that meet your needs. You may find that your local paintball store also sells used paintball guns. If you’re having trouble finding a local paintball store, check out PbNation’s Paintball Store Listings. If your budget allows it, skip the CO2 tanks and invest in a good carbon fiber paintball air tank. Paintball tanks are nearly universal. Almost all paintball guns use a standard ASA thread. Recent innovations in regulator designs also make it possible to change the regulated output pressure. Simply put, you’ll be able to use this tank on any paintball gun you may buy in the future. Therefor it makes sense to invest in a good paintball tank. Compressed air tanks come in a variety of sizes, ranging from 13 cubic inches to 90 cubic inches. The most popular sizes are 68 cubic inches and 77 cubic inches. Those sizes will provide enough air to shoot several hundred paintballs and reasonable in size and weight. There are three types of paintball hoppers: gravity fed, agitated, and force-fed. The simplest hoppers are the gravity fed paintball hoppers. Paintballs are loaded into the top of the hopper and gravity feeds them into the paintball gun. The speed of gravity limits them to a feed rate of 6-8 balls per second. Gravity hoppers will occasionally jam and require the user to shake the hopper to un-jam the paintballs. Agitated paintball hoppers still use gravity to feed the paintballs, but they also have a motorized paddle within them. The motorized paddle stirs the paintballs and reduces jams. Some include a sensor in the neck of the hopper that detects a jam and only activates the motor as needed. Others continuously stir the paintballs. Force-fed paintball hoppers are on the high performance end of the hopper spectrum. Rather than just agitate the paintballs and let gravity feed the paintballs, these hoppers use spring tension to load the paintballs into the gun. Most force-fed hoppers will feed the paintballs at a higher rate than a paintball gun can fire them. They also feed fast enough for a sustained rate of fire. Like air tanks, paintball hoppers are nearly universal. You can buy a good one and know it’ll work on the next gun you buy. Buy a force-fed paintball hopper if your budget allows it. The most important paintball gear purchase you’ll ever make is your paintball mask. Not only is it the most important piece of paintball safety equipment, it’s also something you’ll be wearing all day. You want to make sure your mask fits you and has features that will keep you comfortable. There is only one way to know if a mask is right for you – try it on. Your local paintball store, such as our paintball store in Minneapolis, MN and our other paintball store in St. Paul, MN, will have a good selection of paintball masks. Most stores, including ours, will let you try on a mask to see how it fits. How does the mask fit around your eyes? Does the foam provide a good seal? How does the mask feel on your ears, nose and temples? Does it pinch or put pressure on any part of your head? Does the strap keep the mask secure to your face? Does it bounce around? Is it easy to breath and hear in the mask? Is your view obstructed by any of the mask components? Is the foam replaceable? How is it attached to the frame? Is the lens an anti-fog or is it a thermal? Is a thermal lens available for the mask? A good paintball mask will make your day more enjoyable. There’s nothing worse than wearing an uncomfortable mask that fogs. Aside from comfort, a thermal lens is a must if you’ll be playing outdoors. The time you take reviewing your paintball mask options will be well worth it. Which Paintball Harness Is Best? There really is no single paintball harness that is the best for everyone. Harnesses come in such a variety of sizes and configurations that it’s impossible to make a recommendation. Like paintball masks, the only way to choose the right one is to try them on. Look for a pack that fits well and doesn’t flop around when you run. Make sure you can reach the paintball pods without straining. Features like lumbar support and a zippered pocket for storing valuables are very useful. Elastic straps around the front of the pack help to keep the pack tight to your body. Once you’ve narrowed down your choices, check out the quality of the materials and stitching. Elastic and areas that will be under a lot of strain should be double or triple stitched. The fabrics should be heavy and durable. The pod retention system should hold pods snugly, but not require too much force to remove. It’s important to have a good paintball gear bag to store your investment. A simple duffel bag isn’t good enough. With a duffel bag, everything is in the same compartment and risks your gear being damaged or scratched. A good paintball gear bag will have several pockets and may have designated compartments for your mask or air tank. It may even come with padded sleeves to protect your marker. Don’t go cheap on a gear bag. A wheeled gear bag with a sturdy handle is well worth the money. Look for a gear bag that has large wheels that will travel well over gravel parking lots. Hauling 50 lbs of gear by hand is no fun. Still have questions about paintball gear? 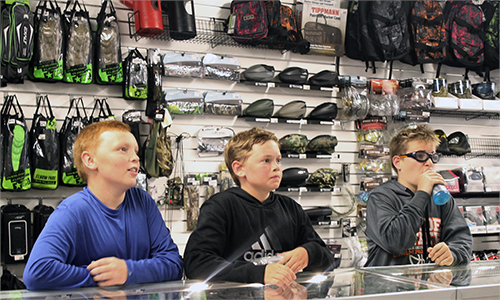 We have two fully stocked paintball stores in Minnesota’s Twin Cities. Our crew loves to talk paintball and they’re happy to answer any questions you may have about the best gear for advanced players.